This example shows the effects of some options for pattern search. The options include plotting, stopping criteria, and other algorithmic controls for speeding a solution. The problem to minimize is a quadratic function of six variables subect to linear equality and inequality constraints. The objective function, lincontest7, is included with Global Optimization Toolbox software. %   vector, whereas objective function gets a row vector. %   Copyright 2003-2004 The MathWorks, Inc. Specify the function handle @lincontest7 as the objective function. The objective function accepts a row vector of length six. Specify an initial point for the optimization. Create linear constraint matrices representing the constraints Aineq*x <= Bineq and Aeq*x = Beq. For details, see Linear Constraints (Optimization Toolbox). 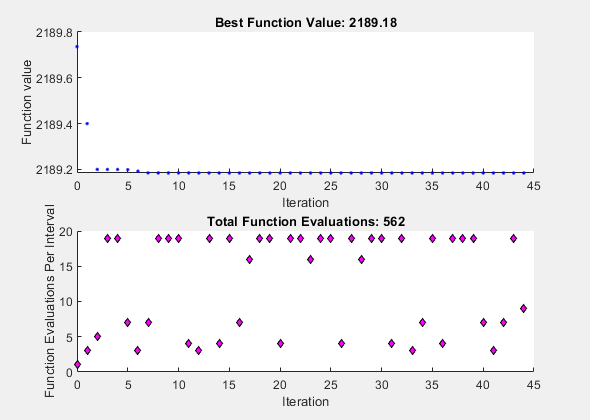 Run the patternsearch solver, and observe how many iterations and function evaluations it takes to arrive at the solution. Monitor the optimization process by specifying two plot functions. Specify the plot functions as the PlotFcn option by using optimoptions. 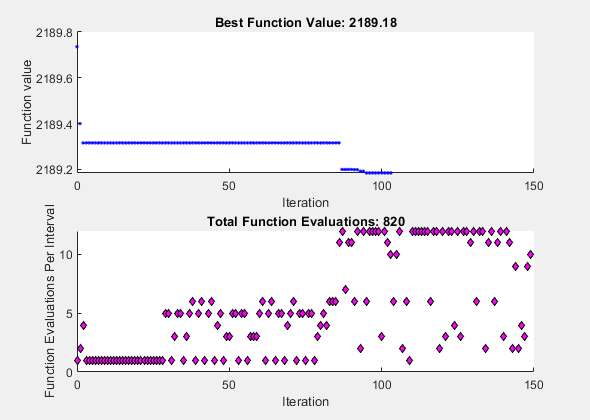 One plot function, psplotbestf, plots the best objective function value at every iteration. Another plot function, psplotfuncount, plots the number of times the objective function is evaluated at each iteration. Set these two plot functions in a cell array. Run the patternsearch solver. Since there are no upper or lower bound constraints and no nonlinear constraints, pass empty arrays () for the seventh, eighth, and ninth arguments. A mesh can be scaled to improve the minimization of a badly scaled optimization problem. Scale is used to rotate the pattern by some degree and scale along the search directions. The scale option is on (true) by default but can be turned off if the problem is well scaled. In general, if the problem is badly scaled, setting this option to true may help in reducing the number of function evaluations. For this objective function, set ScaleMesh to false, because lincontest7 is a well-scaled objective function. Direct search methods require many function evaluations as compared to derivative-based optimization methods. The pattern search algorithm can quickly find the neighborhood of an optimum point, but can be slow in detecting the minimum itself. This is the cost of not using derivatives. 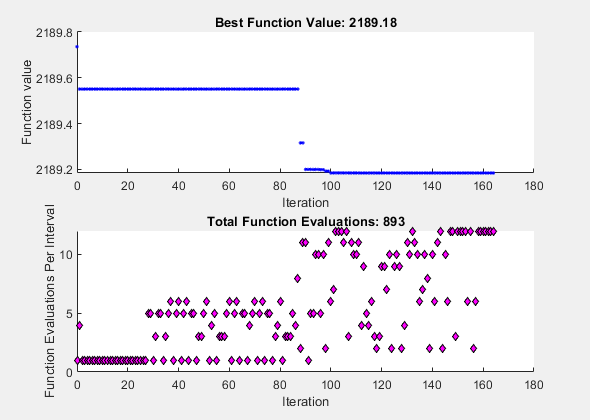 The patternsearch solver can reduce the number of function evaluations using an accelerator. When the accelerator is on (opts.AccelerateMesh = true) the mesh size is contracted rapidly after some minimum mesh size is reached. This option is recommended only for smooth problems, otherwise you can lose some accuracy. The accelerator is off (false) by default. Here, set the AccelerateMesh to true because the objective function is smooth. These option setting reduce the number of iterations and the number of function evaluations, and there is no apparent loss of accuracy. What are MeshTolerance, StepTolerance and FunctionTolerance? MeshTolerance is a tolerance on the mesh size. If the mesh size is less than MeshTolerance, the solver stops. StepTolerance is used as the minimum tolerance on the change in the current point to the next point. FunctionTolerance is used as the minimum tolerance on the change in the function value from the current point to the next point. Set the MeshTolerance to 1e-7, which is ten times smaller than the default value. This setting can increase the number of function evaluations and iterations, and can lead to a more accurate solution. The pattern search algorithm can use an additional search at every iteration. This option is called SearchFcn. When you set a SearchFcn, that search is done first before the mesh search. If the SearchFcn is successful, patternsearch skips the mesh search, commonly called the PollFcn, for that iteration. If the search method is unsuccessful in improving the current point, patternsearch performs the poll. There are five different search method options. These search methods include searchga and searchneldermead, which are two different optimization algorithms. It is recommended to use these methods only for the first iteration, which is the default. Using these methods repeatedly at every iteration might not improve the results and could be computationally expensive. One the other hand, the searchlhs, which generates Latin hypercube points, can be used in every iteration or possibly every 10 iterations. Other choices for search methods include Poll methods such as positive basis N+1 or positive basis 2N. A recommended strategy is to use the positive basis N+1 (which requires at most N+1 points to create a pattern) as a search method and positive basis 2N (which requires 2N points to create a pattern) as a poll method. Update the options structure to use positivebasisnp1 as the search method. Since the positive basis 2N is the default PollFcn, do not set that option. With these options, the total number of iterations and function evaluations decrease. This decrease occurs even though the mesh tolerance is smaller than the previous value, and, as you can see in the exit messages, the mesh tolerance is the stopping criterion that halts the solver.